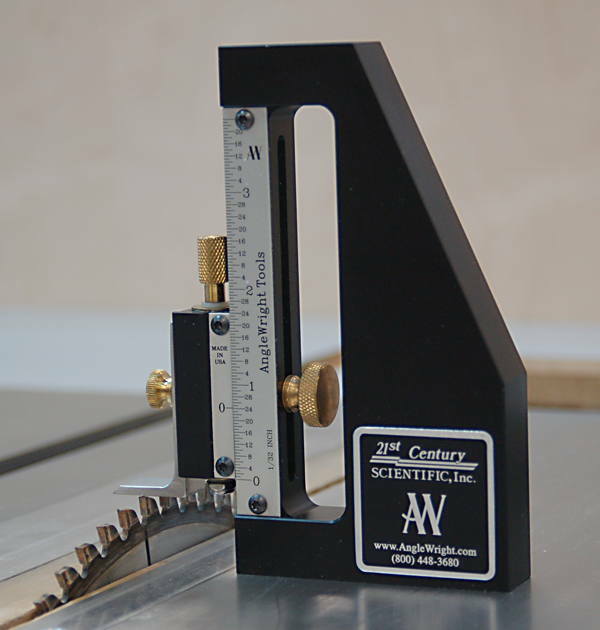 21st Century Scientific is dedicated to continuing the AngleWright tradition of providing solutions to woodworking problems that are innovative, accurate and a pleasure to use. 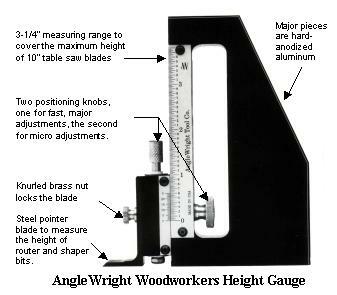 The AngleWright Woodworker's Height Gauge is a compact tool that enables precise height adjustments of shop tools such as routers, shapers, table saws and radial arm saws. The sliding piece that holds the steel pointer blade is dovetailed into the body of the tool. The dovetail ways are hand lapped to guarantee smooth operation. All knobs are recessed so the tool can be used laying flat on its side as well as in an upright position. 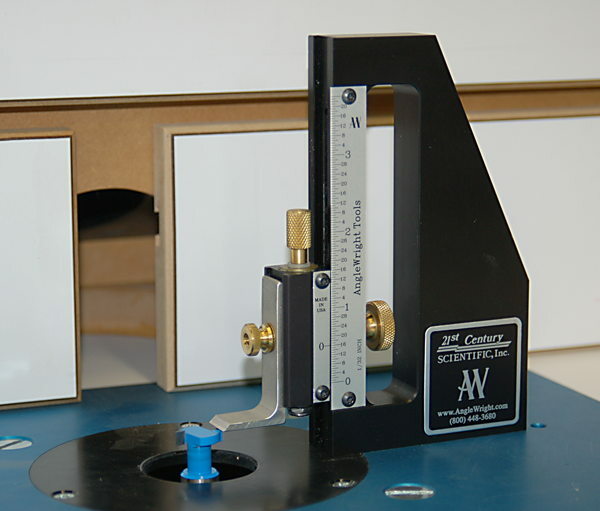 The height gauge ships with the fractional scale installed which has 1/32" graduations. A simple explanation of using a vernier is provided with the tool.The slider scale on this tool has a "0" line only. By positioning this line between the markings on the large scale accurate positioning to 1/128" can be achieved. The pointer is 1/2" wide. This allows it to easily set the height of table saw blades by positioning it approximately where the blade reaches it highest point and gently rocking the table saw blade under the height gauge until it just touches the pointer with a slight ticking sound. TO PREVENT ACCIDENTS: ALL ADJUSTMENTS ON POWER TOOLS MUST BE DONE WITH THE POWER TURNED OFF. 1. Loosen the gross adjustment knob and move the slider so the "0" line on both scales are approximately lined up. Then tighten up the adjustment knob. 2. Use the micro-adjust knob to very accurately line up the "0" lines. 3. Loosen the knob that holds the pointer blade and place the tool on a flat surface. Allow the blade to fall flush with the surface. While holding the blade and the body of the tool to the surface with one hand tighten the knob that holds the pointer. Suggested Retail: $135 plus shipping and handling.